1969 The 1969 Mustang E was offered for those desiring high mpg or Economy. 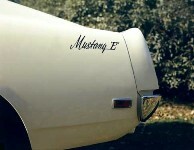 The 1969 Limited Edition Mustang E was a rare (about 50 produced) fastback special model designed for economy. It came with the 250 ci six-cylinder engine, a high stall torque converter for the standard automatic transmission and a very low, 2.33:1 rear axle ratio. Mustang E lettering on the rear quarters identified the special Mustang E.